Located in the Kizilot district in south western Turkey, Sea Planet Resort & Spa is a seafront hotel that features a private sandy beach with a jetty. The resort has outdoor pools with water slides, air-conditioned rooms and an extensive spa centre. Tastefully decorated, the rooms of Sea Planet Resort & Spa feature modern and bright interiors. Each room includes a flat-screen TV, minibar and a balcony. All rooms offer sea, pool or garden views. The main restaurant serves breakfast and dinner as an open buffet, and an à la carte restaurant is also available. You can enjoy selected dishes from Turkish and international cuisine with indoor or outdoor dining options. The bars offer a variety of alcoholic and non-alcoholic drinks during the day. Being a beachfront hotel, the Sea Planet Resort & Spa offers excellent views of the sun, sand and sea. The Antalya Airport is 80km from the resort, while the city of Antalya is 90km away. There are several bars and restaurants around the hotel – within a few hundred metres. The 460 guestrooms at the Sea Planet Resort & Spa are categorised as Standard Rooms, Family Rooms and Deluxe Family Rooms. Out of the 460 rooms, five rooms are specially modified to accommodate differently abled individuals. All guestrooms offer stunning views of the beach, and come with all the necessary comforts required by the modern traveller. Amenities in the guestrooms include a private bathroom (shower, hair dryer, WC), direct dial telephone, electronic key card access, Satellite TV, music channels, air-conditioning, heating, safe box (lap top size), and a balcony or terrace. Free baby cot is available on request. 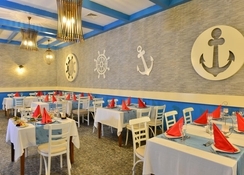 The Sea Planet Resort & Spa features six restaurants – one buffet and five a la carte. The restaurants serve Osmanian, Italian, Mexican and Asian cuisines. The a la carte restaurants are open from 7pm – 9pm. 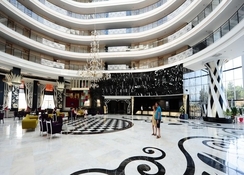 The resort also features six amazing bars: Lobby Bar, Disco Bar, Panorama Bar, Pool Bar, Snack Bar and Bar Azura. Except for the Panorama Bar and the Disco Bar, all other bars are open from 10am – Midnight. The Panorama Bar is open 24 hours. The Disco Bar is open from Midnight – 2am. The Sea Planet Resort & Spa features an indoor pool, an outdoor pool with water slides and a children’s pool. The area around the outdoor pool is fitted with sun loungers and parasols. The spa centre includes a Turkish bath, steam bath, a VIP hammam, two saunas and 12 massage rooms. Treatments for skin and body care are available. There is also a well-equipped fitness centre and a tennis court on site. We had an amazing week with fantastic views ! Amazing holidays.The best service ever. We had realy great experiance. excellent service a bit far from antalya but good if some prefers quite location .in front of beach and over all very good service.